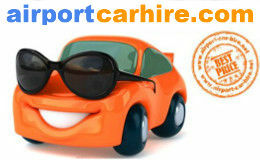 Compare Car Hire at Faro Airport to get the best price for car hire on the Algarve. Quick and simple quotes from the top rent a car companies Hertz, Avis, Alamo, Budget Dollar, National Sixt, Thrifty Europcar. If you are looking to rent a car on the Algarve just request a quote below and we will search the market for you to being you the best deals and cheapest car hire in Portugal, Choose from Convertibles, Smart cars BMW, VW Golf, Ford, Petrol or Diesel Manual or Automatic car available with GPS. 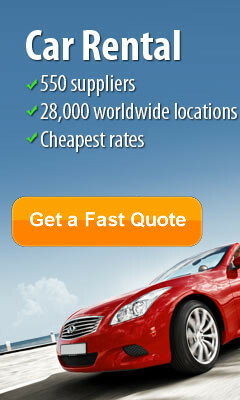 Collect you Car Hire at Faro Airport or Faro city centre at competitive rates. Car Hire is available for young drivers aged between 18 to 25 years of ages at Faro Airport in Portugal. However they will need to pay an additional daily supplement. The amount will depend on the age of the driver, the size of the car and the company they choose to rent from. Payless are one of the few companies that will rent to an 18 year old driver, they charge a young driver's fee of €12.18 per day. Maximum €97.42 which includes 23% tax. 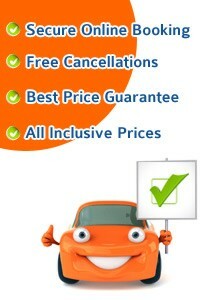 While Best Deal Car Hire charges €5 per day, minimum €15 Maximum €50 Includes 23% tax. For drivers aged between 21 to 24 years. Gold car Charges €8 per day for drivers aged between 21 and 24. This fee will be included in the rental price and will be payable on arrival at the rental desk in Faro in Euros. Car Hire at Faro Airport is available for drivers aged between 65 to 99 without incurring any additional supplement fees. All the rates quoted are fully inclusive and have no hidden fees. Toll fees are not included in your car rental. Drivers over 100 years of age are unfortunately unable to rent a car in Faro. 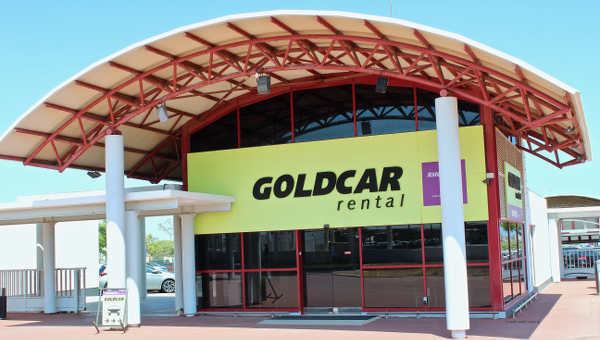 Car Hire: The car rental desks are situated within walking distance just 50 meters across the road from the main terminal in the new car hire centre. Car Parking: Car parking spaces available at Faro Airport for long and short term parking. Bus service: use the local bus service, or take the Faro Airport Shuttle Bus which stops at main resorts close to the airport. 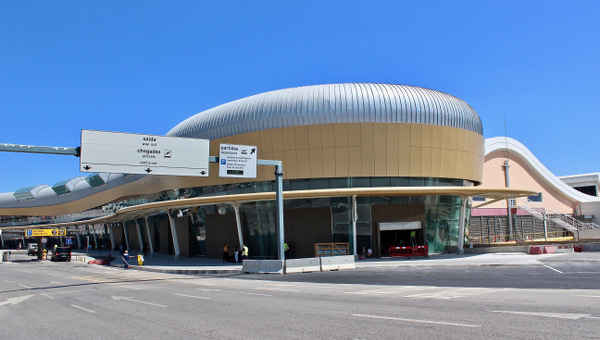 Disabled Facilities: Disabled Facilities are present at Faro Airport. An intriguing mix of old and new, history and vision, the capital of the Algarve is a rich destination for travellers looking for a holiday packed with variety. 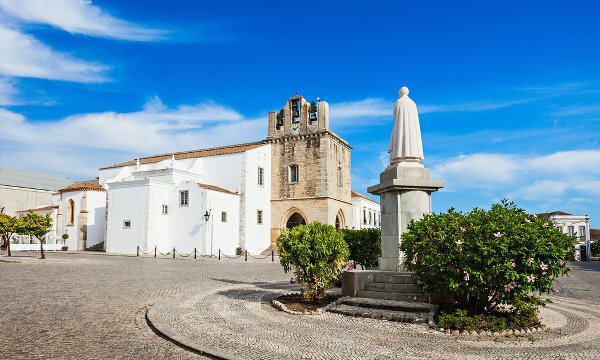 From secluded beaches and deserted islands to bustling old squares and churches made of bones, Faro has plenty to offer eve the most discerning traveller – with plenty of surprises thrown in. Faro Old Town is a stunning place to start exploring the delights of this city. Take an historic walking tour or wander the streets at your own pace to soak in delights such as the marble mosaic paving, the Cathedral with its great bell tower views and quaint, bustling squares. Visit the marina for shopping and seafront restaurants, and take a tour of the hidden Teatro Lethes, to learn about its history, myths and legends. For culture, the Capela de Ossos (chapel of bones), constructed from the bones of monks is an unusual, haunting attraction. Faro Archaeological Museum houses impressive permanent exhibits, with a rich programme of visiting collections. Also visit the beautiful baroque Carmo Church and the Estadio Algarve for sporting events or a tour. If adventure is your thing, diving off the coast of Faro is a popular activity for locals and tourists alike, with a rich marine locality including shipwrecks, artificial and natural reefs, with underwater archaeological tours widely available. One of the highlights of any visit to Faro is the outdoor landscape. Just outside the city you can visit The Desert Island, one of the islands that protects the Ria Formosa from the effects of the ravaging ocean. Recognised as one of the greatest natural treasures of the Algarve region, its wilds boast 11 km of white sand. Another impressive and secluded beach is the Cape of St Mary, reachable via a short ferry ride. Home to sweeping dues, walking trails, azure sea and an amazing number of shells, this is a beautiful spot that cannot be ignored. 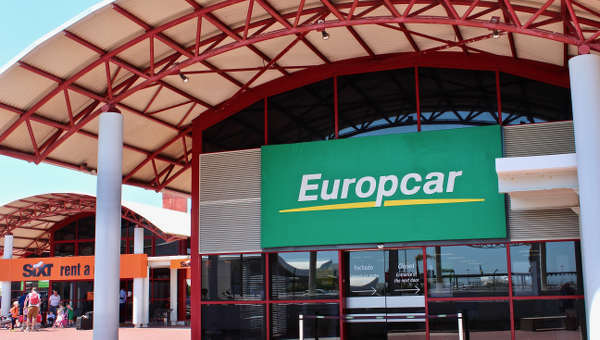 Collect your hire car at Faro Airport and head inland to Loule for a change of scenery. Here, you’ll enjoy ancient quarters, castle ruins, impressive traditional crafts and the fabulous Loule Market. Lagos is a popular local beach destination with plenty of restaurants, beach activities, and an active night life, as well as a rich history worth exploring. If you’d like to travel further afield, Faro is a great base for exploring other countries and territories. Spain is very close to Faro, with Seville only a two-hour drive by car from its old, orange-lined squares, historic buildings, flamenco and warm welcome. Another great excursion is a day trip o overnight trip to Gibraltar, where you will see the impressive Rock of Gibraltar with its cheeky barbary apes, as well as get the chance to pick up some extra cheap tax-free shopping. Praça D. Francisco Gomes, Nº 2 FARO Algarve , Faro, 8000-168 Hotel Faro has 90 comfortable and modernly designed rooms, including 3 suites, the Panoramic Restaurante Ria Formosa, bar and a terrace, located on the top floor of the building that provides a beautiful sight over Ria Formosa and the historical part of the city. The hotel is located in the city centre of Faro, near the commercial and the historical area. The hotel offers services for both business travellers and tourists. The central location in the capital of the Algarve makes the hotel suitable for every occasion. Rua General Teofilio de Trindade, no. 20 , Faro, 8000 The Best Western Hotel Dom Bernardo is a three star hotel located in the centre of Faro, Algarve, Portugal. Modern and equipped with the most up-to-date technology, we offer the maximum in comfort and security for our guests. - Paul Marrow / London. - Marian Horgan / Cardiff. - Tony O'Reilly / Liverpool. - Chris Gibbons / Waterford.